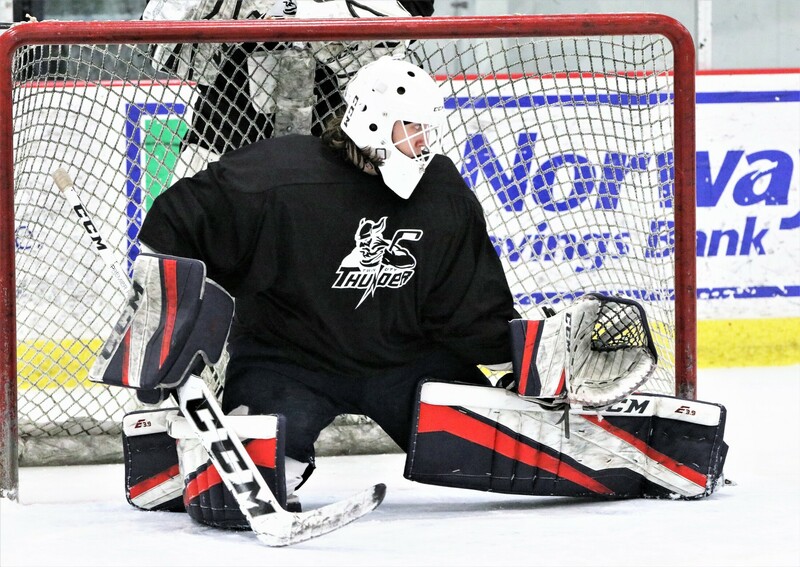 Twenty-four goalies attended the Twin City Thunder goalie camp this past weekend as the organization gets ready for 2019-20. Derek Fournier facing shots at the Twin City Thunder’s goalie camp Saturday morning. AUBURN — Norway Savings Bank Arena was over the weekend as 24 goalies hit the ice for the Twin City Thunder’s goalie camp as the organization looks towards the 2019-20 season. Twin City is working to fill the rosters of its National Collegiate Development Conference (Tier II) and Premier League (Tier III) teams, and the camp offered a chance for the coaching staff to take a focused look at the goaltending position before a regular tryout in two weeks, also at Norway Savings Bank Arena. There were six stations set up around the ice, with four goalies at each station. Goaltenders came from all over, including Sweden and Finland as well as throughout New England. Also suiting up this weekend were the Thunder’s two goalies from 2018-19, Derek Fournier and Jaxon Friedman. They know it’s a new year and they will have to prove themselves again, especially with the addition of the Tier II team. “Of course you always want to get better and play at the highest level as you can, wherever I can get the most minutes,” Fournier, who’s entering his final junior season, said. Last season with the Thunder, Fournier, a Bangor native had a 6-9-0 record with a 3.35 goals-against-average and a .902 save percentage. Fournier is still looking at his options for next year, whether its with the Thunder’s NCDC or Premier team or maybe trying to latch onto a NAHL team. Jaxon Friedman, meanwhile, tried to block out the number of goalies on the ice this weekend. Last year, Friedman went 12-4-0 for the Thunder with 2.76 goals-against average and a .929 save percentage. Also on the ice for the goalie camp was Brenden Gasaway, who backstopped the Maine Moose 18U midget team to the USA Hockey Tier II 2A 18U National Championship with a 6-3 win over Mission Red earlier this month. He went 3-1 during the tournament with a 2.65 goals-against average and a .939 save percentage. During the regular season he went 7-7-0 with a 4.21 GAA and a .860 save percentage. The Old Town native thinks just finishing his season several days before the camp was a blessing was beneficial.